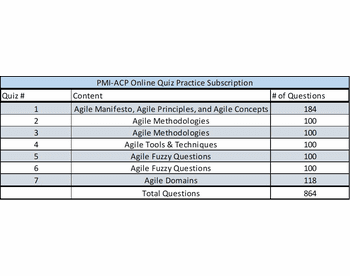 The PMI-ACP Quiz Practice: Approximately 200 questions are in your Agile Workbook & 800 questions Online which include those in your book. Online practice is recommended for interactive and simulated study. All quizzes will be set up and activated within 24 hours or less of your purchase or according to your start date request in the comments' box. You will know that your practice has started when you receive the activated quiz links. The intent of the PMI-Agile training is that you will take your Exam within 30 days or sooner. Most people have taken the Exam before 15 days. See the attached quiz list. Click on it to expand it, followed by control P if you wish to print it. Please understand that these are mock questions. There is no such thing as REAL PMI-ACP Exam questions for you to practice. Understanding your knowledge and being able to apply it is what this exam is all about. SmartPath LLC is aware of psychometric testing and how to prepare trainees to pick the correct answers. Most trainees will use their computers to participate in the Online Quiz practice; those who have appropriate apps are also doing the quizzes using cellphones or other devices. These questions are all copyrighted and represent SmartPath LLC's original works. These questions are for individuals seeking to understand Agile so they can pass the exam. They are not to be used for commercial purposes or re-sale. You may use a tablet, computer or smartphone to do your quiz practice. However, be aware that if your smartphone is older, you may not be able to use it, even with updated IOS.